I love spring- who doesn’t? Not only is the weather great, but so is the food. Like most family’s, mine has a tradition of spring barbequing, picnicking, and park-going. But one tradition that holds a special place in my heart is spring pie-baking. Me and my older sister learned pie-making at the elbow of my mother when she used to make pies for holidays like Christmas, and since then we’ve taken up the torch (or roll of dough) and picked up where she left off- she’s not dead, she just doesn’t have to bake them with us around anymore (my sister thought I should add that because it she felt it sounded like a eulogy). 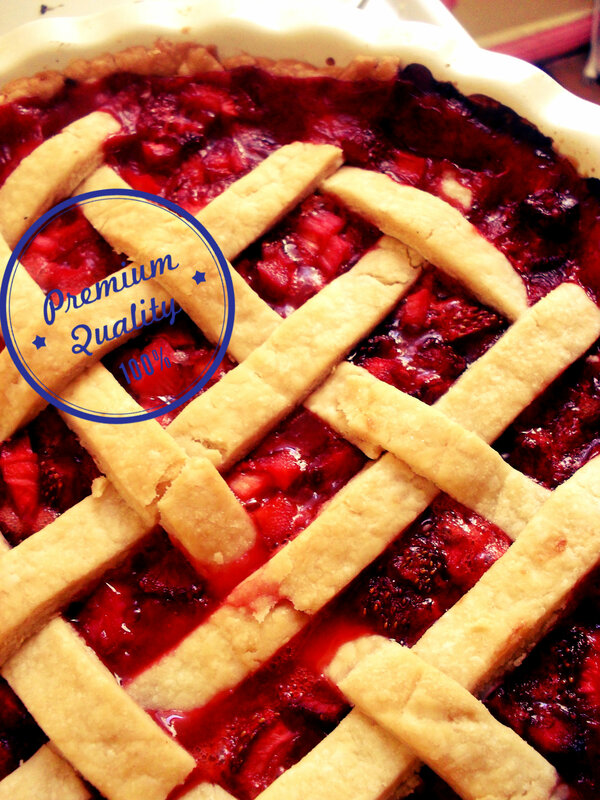 Anyways, my most favorite pie is the one my sister makes every spring- Birdy’s Strawberry Rhubarb Pie. The buttery crust for this pie is a perfect cradle for the tart-sweet interior, enjoy with a heap of vanilla ice cream. So I thought I’d bamboozle her into letting me use her recipe here on my blog- thanks sis! note: use a large sized bowl otherwise it’ll get all over you! 1.Dump the flour into a bowl, and run your fingers through it to work out any clumps (you can use a sifter if you have one). 2. Add the Crisco, and start pressing into the flour with a fork or knife until it is distributed all through the flour in small pea sized pieces. DON’T make them too small. Those clumps of Crisco make the crust flaky! 3. Add in the water around the edge of the mixture, and rake it in with a fork until it is completely absorbed into the flour and Crisco. It will still look dry, which is GOOD. 4. Remove ANY jewelery at this point. Take your hands and starts pushing into the dough mixture until it starts to stick together and you can hold it in your hands. you should get a ball of dough the size of a softball. If you see some remnants of flour in the bowl its okay. 5. Take some plastic wrap or a gallon sized baggy and flour lightly. Put half the dough in between the floured plastic layers. Using a heavy rolling pin (or even a bottle of wine or olive oil) press down on the dough in circular motions until you have a round-ish shape. 6a. If for the inside of the pie, put in the pan and use your fingers to pinch off the excess around the rim. 6b. If for the top, you can cut it into strips (still on the plastic, and carefully lay them one by one in a criss-cross design. note: you can prepare filling first so it can sit while you make the crust! 1. preheat oven to 400 degrees Fahrenheit. Roll out half of the pie dough and put in pan. Roll out other half and cut into strips and set aside. 2. Mix together the rhubarb, strawberries, sugar, flour, and lemon juice. set aside for a half hour. 3. Pour filling into crust and create lattice with dough strips on top. 4. Slide into the lower middle rack and bake for 20 minutes at 400, than turn the oven down to 350. cook until you see the filling starts to bubble and leave a thick red syrup on the crust. 5. Take out and rest until it fully cools. if you don’t, the filling will fall out when you cut it. Serve with vanilla ice cream and dig in!! I’ve never had rhubarb, but the pies looks delicious!